🥇 New Roomba i7 vs 980 ➔ Why Roomba i❼ is the Best? Hello folks, today I want us to find out whether the Roomba 980 has finally been dethroned as the best Roomba model and consequently, the best robot vacuum cleaner in the market. 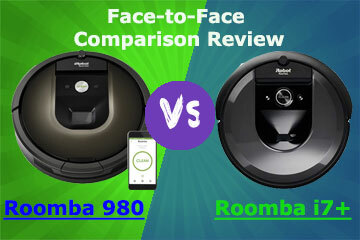 Find all that in this comprehensive face to face Roomba i7+ vs. 980 comparison review. 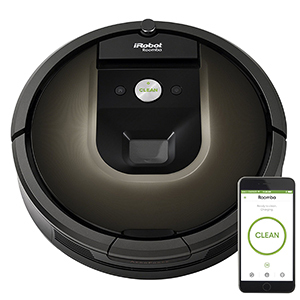 If you have been peeping through the tech news, especially Smart home topics, you must have heard of the new Roomba i7+ which is the latest model from iRobot, arguably the best robot vacuum brand. I know you must have been interested in the conversation between Roomba 960 vs. 980 which were the best and latest Roomba models but with the coming of the i7+, maybe you should first find out if it should change your mind on what Roomba to purchase. As usual, we ordered the robot vacuum and were it not for the delayed delivery; you should have read this review a week ago. So without further ado, let’s get straight into the Roomba 980 vs. i7+ comparison review to find out if the i7+ has finally beaten the Roomba 980. But first, a summary of the two models. If you ask around, the Roomba 980 is the best robot vacuum cleaner for several years now. Despite the high price tag, it has proved that it is worth every penny by putting out the best performance and durability. Several other models from other brands have come, but none has been able to beat the Roomba 980. One of the significant features of the Roomba 980 is the new Gen 3 motor that delivers ten times more air power. It can also run on two power modes, with the high power mode, Carpet Boost making it best for high pile carpets. You will also like the new iAdapt 2,0 navigation system that blends the data from the sensors as well as the camera for more accurate and precise navigation in high traffic rooms. This is the latest model in the Roomba series, and actually, one that caught us off guard. A lot of us expected iRobot to release a Roomba 1000 series. But instead, they put forward a completely different product, so we are about to see its worthiness in the face of the Roomba 980. The Roomba i7+ is quite similar to the Roomba 980, but the major difference is the fact that this model can empty the bin by itself. iRobot built a new self-cleaning system called Clean Base. This makes it a fully robotic vacuum cleaner now that the Roomba 980 and the rest will require human intervention when the bin is full. If you don’t want the expensive version that comes with the CleanBase, you can opt for the base model that includes a robot vacuum only at around $650. Now, we have seen the major highlights of each model and the salient features. So, it is time we get to the main agenda of the day, comparing the Roomba i7+ to Roomba 980. We want to see whether the new Roomba i7+ is a better vacuum than Roomba 980 that has stayed top even after other brands released some serious competitions, for example, Dyson 360 Eye and the newer Neato Botvac D7 Connected. To help you get the most out of this comparison review, we have tailored it to serve as a comparison review as well as a robot vacuum buying guide. We will compare the most critical aspect of a vacuum cleaner and see how the Roomba i7+ and Roomba 980 square it out. For every factor, we will then give our verdict on what’s the best Roomba between the two. The First thing we want to do in this face-to-face comparison review is to differentiate Roomba i7+ from Roomba 980. This is with regards to the shape, dimensions, and weight and lastly, the aesthetics. As you are all aware, Roombas bear the round shape design, and so does the Roomba 980. It stands at 3.6-inches high and has a 13.6-inch diameter. When it comes to weight, it read 8.6 lbs. on our scale. Lastly, Roomba 980 has a subtle dark finish with a bright silver clean button slightly at the top allowing space for the tiny camera. For the Roomba i7+, the round shape has been maintained. However, it has a smaller, width, 13.4-inches to be precise and stands at 3.7-inches. Regarding the weight, this model is much lighter at 7.45lbs only. It has been finished in a much darker charcoal finish, but the large CLEAN button is still on the same spot as it is on the Roomba 980. Winner: I don’t think there is a clear winner here now that each model has advantages and disadvantages. While Roomba i7+ might be lighter, the Roomba 980 is shorter. But I think the benefits of a shorter robot vacuum outweigh those of a lighter robot vacuum. This is because most of the furniture has low ground clearance and thus, you need a low-profile vacuum to creep under this furniture, where most dirt hides. Now, next up, we want to see how the Roomba i7+ compares to Roomba 980 when it comes to cleaning performance. This is a very important segment of this comparison review. So, we will be a little bit detailed. We are going to discuss the different aspects that you should consider when buying a robot vacuum cleaner and most importantly, a comparison of Roomba i7+ vs. Roomba 980. Without further ado, let’s get to business. Cleaning Priority – This is the most important aspect when choosing a robot vacuum cleaner. Not all vacuums will handle all your cleaning needs as each model is specialized for specific duties. The same versatility is reflected on the Roomba 980 which also cleans hardwood floors, hard floors, tile, carpets, pet hair, and pet-related allergens. Roomba i7+ has been designed to offer the best in class performance on hard floors, hardwood, tile, carpets, pet hair, and allergens. In short, this is an all-round robot vacuum cleaner. Motor – One of the integral parts of a robot vacuum is the motor. This is the part responsible for generating the suction power that picks up dirt from the floors. I hope you understand the essence of high vacuum power, so let’s see which Roomba has the best motor. Roomba 980 boasts the 3rd Generation brushless motor that has a dominant performance and is very efficient. It can run on two power modes, high and low. While in normal mode it can deliver 1000 Pa, in high mode it can go up to 1,700Pa. On the other hand, the Roomba i7+ maintains this same motor and also has Eco and Turbo mode just like Roomba 980. The vacuum power ranges from 1,000 Pa to 1,700 Pa, and that’s why it’s suitable for high pile carpets. Brush system – Now, let’s look at the brush system of the two vacuums. If you have pets, this is an aspect you want to be very careful on lest you end up with a vacuum that gets tangled now and then. Roomba 980, just like all the Roomba 800 Series and also the Roomba 960 has a dual multisurface brush system. They are made from rubber meaning they are gentle even on the fragile hardwood floors. The anti-tangle system, on the other hand, makes sure your long hairs don’t jam the brush. Nothing much has changed in the new Roomba i7+, probably because of the efficiency of the current Roomba brush technology. You can trust in on your hardwood floor and also amidst long pet hairs that often tangle the brush. The rubber material also makes it long lasting and thus, easy to maintain. Filter – If your house usually has a bad odor, maybe from the pet dander or other causes, then you need a HEPA filter. These filters are much more efficient than what the average robot vacuums come with. Roomba 980 boasts the AeroVac filter system that employs a set of HEPA filters for improved efficiency. They can filter out 99.97% of allergens leaving you in a fresh ambiance. The filter is another feature that Roomba i7+ and Roomba 980 share in common. The i7+ also uses the AeroVac filtration system so if you have nasal allergies; it is still a great option. Dirt Detect – If you are not new to Roombas, you understand that one of their unique features is Dirt Detect; a function that finds places with dirt concentration. It then tells the Roomba to advance to that place and switches to Spot mode. Roomba 980 comes with the 2nd Generation Dirt Detect technology, also known as Dirt Detect Series II. It uses acoustic and optical sensors to find dirt concentration. The same applies to the Roomba i7+. It will also find places where there is concentrated dirt, and the advantage of the i7+ is the fact that it will probably clear all the dirt courtesy of the bin-emptying system. Bin management – Lastly, let’s look at how these two robot vacuums manage their bins. The first thing to scout for is the bin capacity. But then, here’s a spoiler. The Roomba i7+ has a bin emptying system. For the Roomba 980, it is essential to consider the bin capacity because once the bin is full, the Roomba stalls until you empty it. This is among the few reasons why robot vacuums were considered not fully robotic. Gladly, Roomba i7+ comes with an automatic bin emptying system. 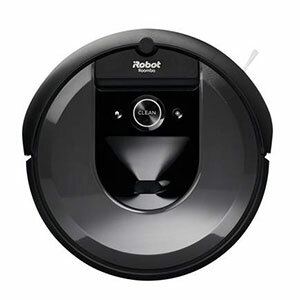 It is compatible with the iRobot CleanBase unit. Once the bin is full, the robot will go to the disposal unit and empty the bin. Winner: Having compared the features, it’s time we give our verdict on what’s the best Roomba between the 980 and i7+. Here, we want to go off course a little bit by also analyzing the cleaning performance before declaring the winner. As usual, we tested the two robot vacuums to ascertain which model will be a more practical solution for your cleaning needs. The first thing we embarked on after receiving the Roomba i7+ was to schedule a comprehensive cleaning test to see how it performed. We used some of the everyday dirt on a hard floor, low pile carpet and high pile carpet. The two bedroom apartment houses two pets; my German shepherd and my wife’s cat. We used the everyday dirt that you will be dealing with on a daily basis; cereal, sugar, rice, flour, sand and so on. A better part of the house has tile except for the living room. The rest of the house has a tile floor, so that was the perfect place to test the performance of these two robot vacuum cleaners. It is important to note that on these two surfaces, the performance was just the same and that’s the reason we clustered them together. Here is a representation of their performance. Both the Roomba 980 and i7+ performed exceptionally on hard floors. They managed to collect 100% of the dirt. This was not a good test enough bearing in mind even the cheap robot vacuums like Deebot N79s and Shark ION V750 excel on hard floors as well. There has been a major misconception when it comes to shopping for the best robot vacuums for carpets because every brand labels their product as carpet robot vacuum. Well, the fact of the matter is that not every robot branded as robot vacuum for carpet will handle all carpets. In most cases, they can only work on low pile carpet and not high pile as you will see below. On low pile carpet, the two Roombas start getting noticeably overwhelmed. As you can see, the small dirt was a problem, especially flour and kitty litter. But this is far much better than what your average robot vacuum cleaner will do. This is the real test for many robot vacuum cleaners, especially the cheap robot vacuums that are commonly labeled as carpet robot vacuums. But what makes vacuuming a high pile carpet hard? Well, the high pile has a lot of interwoven fabric that leave a lot of spaces where the dirt hides. The denser the pile, the more vacuum power required. To show you how vacuum power is critical, we have compared the performance of Roomba 980 and i7+ with Gen 3 motors to Roomba 650 with a 1st Gen motor. As you can see, even for the best robot vacuum cleaners, it is still hard to clear all the flour. The fine particles hide deep inside the pile. That means, even after buying a robot vacuum cleaner, your regular vacuum is still indispensable. You will need it for general carpet vacuuming, maybe once in a blue moon. Also, you can notice that in as much as the two vacuums have the same motor, the Roomba i7+ was dominant because it was still new; the Roomba we used is like eight months or so. Winner: Now, what’s the best Roomba regarding cleaning performance between Roomba i7+ vs. Roomba 980? The Roomba i7+ carries the day because of the bin-emptying mechanism. You won’t have to worry about the bin full notifications anymore. The autonomy of a robot vacuum cleaner is another critical consideration. You want a robot vacuum that will complete vacuuming the house on a single charge. If it can’t, at least it should be able to resume cleaning after recharging. You should also choose your robot vacuum cleaner depending on the surface. Note that on hard floors, a robot vacuum’s autonomy is longer than on a high pile carpet. So, what does Roomba 980 and i7+ offer as far as battery performance is concerned? Roomba 980 comes with a 3,300 mAh lithium-ion battery that can last the robot for an average of 120 minutes on hard floors and around 100 minutes on carpets. The recharge time is 2 – 3 hours, and after recharging, it will resume cleaning from wherever it left. The Roomba i7+ is also an intelligent robot vacuum cleaner that will automatically go to the charging base once the battery is low. It will recharge and resume cleaning just like the Roomba 980. It packs a lithium-ion battery as well, rated 1830mAh with a runtime of around 75 minutes. Winner: Still, the Roomba 980 deserves to be the best Roomba courtesy of the longer runtime. Even though they will both resume cleaning after recharging, the recharge time is quite long so longer runtime reigns. Unless you want to be finding your vacuum stuck all the time, it is imperative that you buy a robot vacuum with the best navigation system as well as maneuverability. When it comes to the Roomba 7150 vs. 7550 vs. 980, the debate is around iAdapt 3.0 vs. iAdapt 2.0. Roomba 980 took the market by storm with the revolutionary iAdapt 2.0 that combines sensors and a real-time camera for enhanced navigation accuracy. The mapping is also efficient as it also uses the same iAdapt 2.0 navigation. When it comes to the maneuverability, Roomba 980 has a self-adjusting head that sets itself depending on the surface. The wheels are huge and will seamlessly transition from carpet to bare floors easily. Regarding boundary marking, this model is compatible with Virtual Walls as well as Lighthouses. On the other hand, the Roomba i7+ comes with a much more advanced navigation system, call it iAdapt 3.0. In my opinion, there is nothing much it brings on board as the sensor and camera is still the principle. The difference is the fact that the i7+ uses Imprint™ Smart Mapping technology. It enables the Roomba to identify the room it is and keep a record that allows it to remember the different rooms. Carpet to floor transition is seamless, and so is the head adjustment. Roomba i7+ also supports Virtual Walls, but it comes with only one node. Winner: Definitely, the Roomba i7+ takes the crown here. You will like the Imprint Smart Mapping feature as it enables you to instruct the robot where to clean, and when. Everyone wants a Smart home, and gladly, iRobot has been at the forefront of Smart home innovation. They have robot vacuums with the latest Smart features including Wi-Fi, Alexa, and other 3rd party integrations. Roomba 980 is best known for its full suite Smart features. It comes with 2.4GHz Wi-Fi for Smartphone App operation and Alexa. You can schedule the Roomba to start cleaning at your preferred times just like most vacuums. On the other hand, Roomba i7+ also comes with the Wi-Fi and also supports Alexa and Google Assistant. Just like Roomba 980, it supports wireless upgrades offered by iRobot. This robot also supports Schedule function. Winner: I wouldn’t say there is a winner really because both vacuums have the necessary features when it comes to Smart convenience. But overall, the Roomba i7+ is the winner because of the convenience of CleanBase. Now, we have come to the end of our Roomba i7+ vs. 980 comparison review. It is time to choose the best Roomba between the two high-end vacuums. In the Roomba 980 vs. i7+ debate, the Roomba i7+ looks very promising and better than Roomba 980. However, in as much as we may have loved the Roomba i7+, it has not passed the test of time yet. We have barely had the Roomba i7+ for a month. It’s not yet in the market, so we can’t guarantee its reliability. Maybe after a few months, once thousands of units have been sold, that’s only when you can satisfactorily say that the Roomba i7+ is the best. The power and cleaning ability of the i7 did not advance noticeably over the 980; I have the 980 and I think the cleanining is amazing over my 2200 sq foot floor plan, with varying surfaces. The run time is better on the 980 than the i7. The 980 needs to make several trips back to recharge if I expected the whole house to be cleaned, but I have used the virtual walls to isolate areas or closed doors to limit and rotate cleaning areas. The bin capacity when I first started with the 980 was a challenge; I needed to empty the bin before cleaning jobs were done. This has improved now that I am on a regular weekly schedule. The mapping ability of the i7 might be cool to set up, but my low tech process of limiting and controlling the cleaning area for my 980, works just fine. It is my house after all, not the Hilton! I was intrigued by the i7 for the self emptying base but not enough to give up my 980. The i7 is chunky and won’t go under areas that my 980 would. Regarding the emoting tower for the i7, I see that it is available as a stand-alone purchase. What would prevent someone (or the company) from offering a replacement bin for the 980 that would allow it to use the tower and be charged and emptied?? That would be a feat of reverse engineering! I own one 980, Not many 980 were sold due to high $900 price. The low height design is perfect for under our furniture. New i7 will be too high and blocked for some furniture. Important 45% increase in battery run time. The Roomba company are becoming greedy with the i7, they need to offer the new bin redesign option for the 980. .
3500sq ft to clean of both hardwood and carpet, Purchased in July 2017. I have been trying to decide between the 980 and regular i7 and this review was really helpful! I have a messy parrot who flings food everywhere so I have to vacuum at least once a day. It is great to know that the i7 works as well (or better) on higher pile carpet than the 980 with the various types of “dirt” tested.. I am sold. Thank you! Thank you for the comparison on features and test results between the 980 and i7. As a new owner of robotic cleaners, and owning the i7+, I can say, without any reservation, that the self-emptying ability provided to the i7+ is what the entire niche market has been lacking. Now that iRobot has brought this to market first, I predict that the other robotic manufacturers will follow suit. My house is large. For the cleaner to cover everything in a “single” scheduled cleaning requires the bin to be emptied multiple times. So, while the Roomba 980 may have a greater endurance over the i7, the fact that the i7 will go home and empty the bin at the clean base, recharge, and resume, trumps the 980’s endurance. The alternative is for you to break up your large floorplan into smaller sections dictated by the capacity of the bin and your willingness to manually empty it before sending the robot onto its next “room”. I have enjoyed kicking off a cleaning of the entire floorplan in the morning, and coming home to a completed job. Sure, between cleaning runtime and charging cycles, it takes 9 hours … but, my entire space is clean (well, cleanish … these are still no replacement for a real vacuum and human). What about the dust bags of the i7: are they reusable? Hi, Richard! Thank you very much for this article! Very useful and complete! Do you think the i7 is still worthy even if having to spend money in a regular basis to purchase the disposable bags?